Its offical. On April 16, 2010, I ended my 10 year career at KPA to set out on my own. Exciting times. I have set up shop with Dylan F. Pollard, also formerly of KPA. 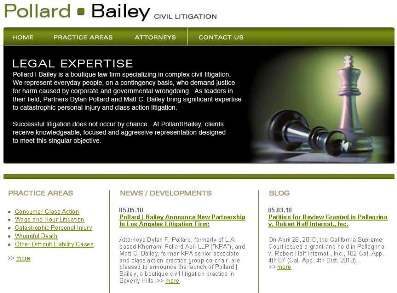 The new Firm – Pollard | Bailey – is based in Beverly Hills and will focus on plaintiff-side class action and catastrophic personal injury litigation. The Firm website is located at http://www.pollardbailey.com/. My new email address is mbailey@pollardbailey.com.